I got pretty excited seeing rows of scrappy, green leaves emerging from the ground between a couple of my pawpaw trees. 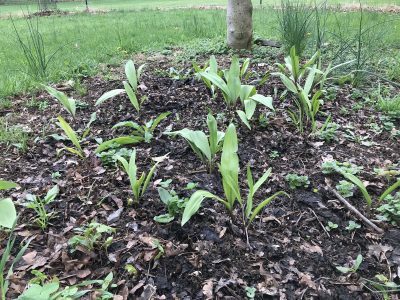 The leaves were those of ramps (Allium tricoccum, also commonly known as wild leeks) that I had first planted there two years ago, with an additional planting last year. There’s no reason that ramps shouldn’t thrive here on the farmden; they’re native from Canada down to North Carolina and from the east coast as far west as Missouri. They’ve been best known in the southern Appalachian region, where festivals have long been held to celebrate the harvest. The season’s first peas and potatoes are such a taste treat, radishes are fun, and everyone pines for the first tomatoes. But kale, I think, is the vegetable most worthy of praise. Here I am in the greenhouse, watering kale transplants for the garden even as, right behind me, kale in beds planted last August are still yielding mature leaves for salads and cooking. Such as, for instance, three edibles: seakale, chufa, and oca. 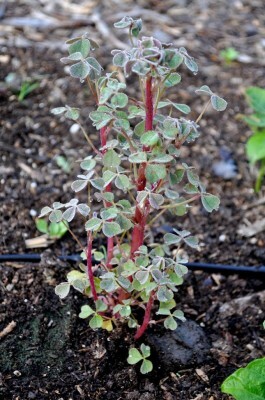 Let’s start with the seakale (Crambe maritima). This plant had been growing at the edge of one of my flower beds for many years but died last year. 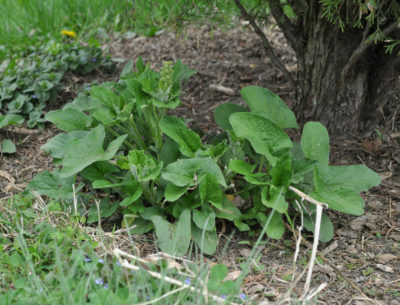 I never did try eating the plant but had earned a permanent place in the flower bed for its gray-green leaves and attractive sprays of 4-petalled white flowers. Those two characteristics would also rightly land the plant in the cabbage family.